The P26 balances very well and it's pretty easy to set up a self steering system. Mine has a 15" bar with a knob adjusted slider that I salvaged from a video equipment rack. 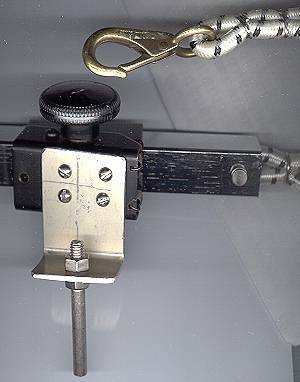 The slider has a pin that drops into the tiller extension mount. 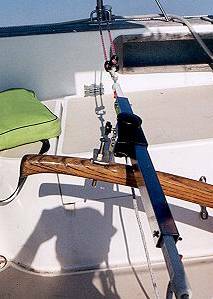 It is suspended across the cockpit between two heavy sections of shock cord that attach to the stachion base with snap clips. 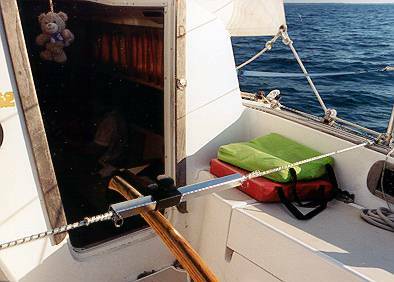 On an upwind course I balance the sail trim with just a little weather helm and tweak the position of the slide. The adjuster could be suspended with line but the shock cord lets me make temporary course adjustments. The slider pin just drops into the tiller so it can be pulled right out. It has no tendency to jump out and I can pull it out and let it hang below the tiller for tacks. I keep the tiller stock just tight enough that if you pull it up a few inches it stays there. As the boat falls off the main draws more increasing weatherhelm making the boat head up. As it heads up the main draws less decreasing weatherhelm making the boat fall off. 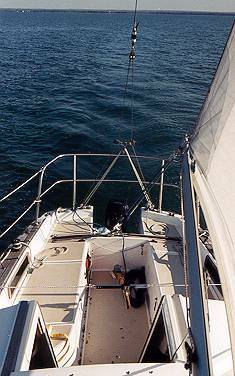 The boat will generally hold it's course with 10-20 degrees of wander depending on wind and waves. I have set it and not had to touch it for a half hour at a time. As you move around the boat the course will change a bit. Go to the low side and you head up a few degrees and hold. The day I shot this photo was a particularly good one for self steering. You can just make out the nice straight wake in the photo. With the self steeering set and the boat balanced I went to the mast, slacked the jib halyard and went to the bow to swap the jib pennant for a shorter one. The boat held course through it all. Next season I plan to experiment with sail controlled self steering systems as described in John Letcher's book "Self Steering for Sailing Craft" and Lee Woas book, "Self Steering Without a Windvane". A guide book to self steering systems on small boats. Lots of theory (with math!) and applications. Letcher is a PhD in aeronautics and applied math and has tested the applications in the book on offshore passages including some to Hawaii. The subtitle of this book is "A Comprehensive Manual of Natural and Sheet-To-Tiller Steering Systems for Sailboats" and that's exactly what it is. An excellent guide with lots of illustrations and tips. Out of print but well worth searching for. Amazon.com found me a copy. This shot shows the adjuster in early trials. It's mounted with bungies and some small line adjusters to control the tension. This shot shows the adjuster with the shock cord and snap clips. This is a close-up showing the adjuster mechanism and the pin that goes into the tiller.